Bucktown Garden Walk Needs Gardens, Will Yours Be Spectacular By Aug. 6? Tour over 60 neighborhood gardens at this year&apos;s Bucktown Garden Walk. BUCKTOWN — Organizers of the Bucktown Garden Walk, a community event that brings together nature lovers, have put out a call for gardens to be featured in its annual walk. Though the event, set for 10 a.m. to 5 p.m. Aug. 6-7 is almost three months away, Meredith Flagstad, a co-organizer, said Wednesday that now is when everyone is planting, so it would be a great time for residents to start planning to add their gardens to the walk. During the walk, personal green spaces and otherwise exclusive gardens are open for public display. Previous years have featured as many as 80 gardens. 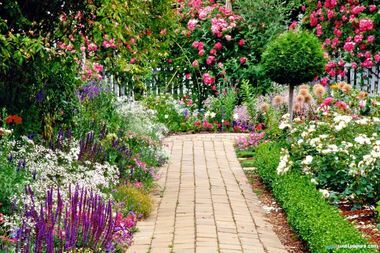 Gardeners can sign their garden up online; there is no fee to register a garden. Proceeds from the walk, which asks a $10 suggested donation for entry at one of three check-ins (Club Lucky, Churchill Park or Lottie's), benefit the Bucktown Community Organization, which puts the walk together. The group will use the Garden Walk proceeds on neighborhood beautification projects, tree planting and green initiatives, Flagstad said. Local businesses will join in the festivities, offering a Petting Zoo at Lottie's Pub and live music at Club Lucky. The Park District has also permitted the use of Churchill Park, 1825 N. Damen Ave., as a check in point and there will be a children's area in the park, including urban gardening education, Flagstad said. Once visitors grab a guide at any of the three check-in locations, they can do a self-guided tour of the local gardens or hop on a trolley to shuttle around to Bucktown’s most beautiful gardens. Local arborists will also be available for educational walks to help folks identify trees in the neighborhood's urban forest. For questions or further info, or to sign up to be a volunteer, email Flagstad at garden@bucktown.org. For photos from previous years, visit bucktown.org/GardenWalk.